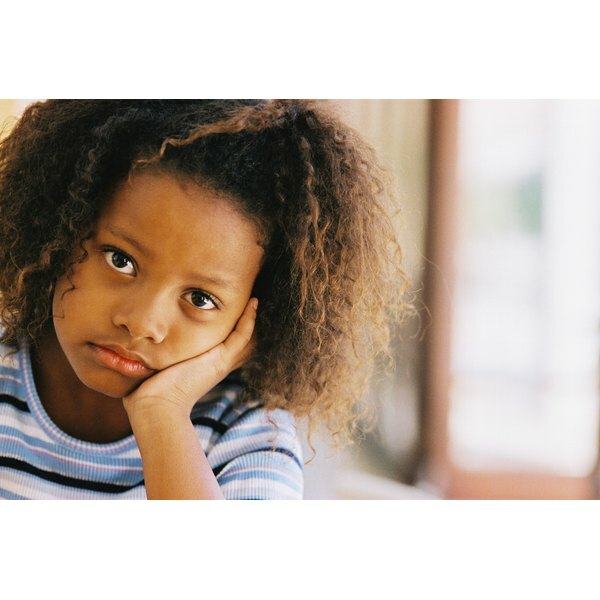 Pouting is a common reaction that kids have when they get angry, don't get their way, or feel neglected. While pouting is more common in younger children, even older kids and teenagers can resort to pouting when they are upset. Understanding what causes kids to pout is the first step in learning how to curb this bothersome behavior. Pouting is common in young children because they lack the emotional intelligence to express themselves in a healthy way. Psychologist Suzanne Bronheim told The Baltimore Sun that young children have not yet acquired the vocabulary to express their feelings, and may not even be able to recognize their feelings. Young children just react to feeling upset, sad, frustrated or angry, and that may include pouting or even throwing a fit. Helping children learn to identify and express their feelings can reduce pouting and other troubling behavior. Even older kids who know how to express their feelings may pout because they feel like they don't have an outlet to express themselves. Kids who don't feel safe saying what they want to say will use passive methods such as pouting to let others know they are unhappy. The children of parents who are overly strict or authoritarian may not feel like they can say what they want or express their displeasure, and so they may resort to pouting or sulking. Kids who feel like they can tell their parents what they are thinking and feeling are less likely to pout or to act out. For many children, even negative attention is good attention. If kids are feeling like they aren't getting enough attention, they may resort to negative behavior such as pouting to get it. Even if adults are annoyed or upset by the pouting, they are focusing their attention on the kids. Ignoring the pouting may also intensify the behavior since kids may feel like they need to do even more to get a reaction. If pouting is a play for attention, parents may need to spend more one-on-one time with their children or spend quality time together as a family. With some parents, pouting gets a reaction. Children may get the toy they wanted or be allowed to leave the dinner table without eating their vegetables. When children learn that they can get what they want by pouting, they will do it more often. For some parents, the best way to deal with children when they are trying to manipulate through pouting is to ignore them. Once they have calmed down, parents can talk with them about better ways to handle disappointment and frustration.